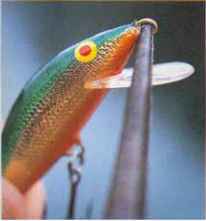 Minnow plugs have a shape and swimming action remarkably similar to those of shiners or other slim-bodied baitfish. 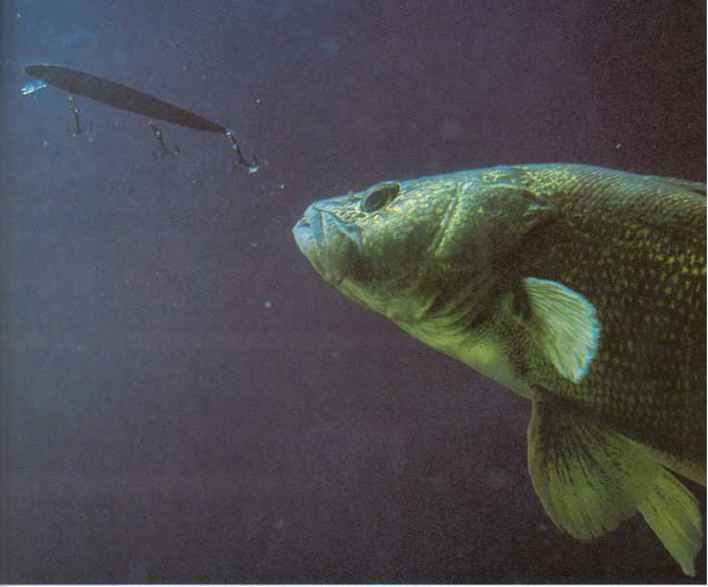 Because minnow plugs rely mainly on their visua1 appeai to attract fish, they work best in relatively clear water. They do not produce as much sound as crankbaits or vibrating plugs, so they are less effective in waters of low clarity. Minnow plugs generally have smaller lips than crankbaits, so the head does not swing as far to the side when the plug swims. The tight rocking action is less violent than the action of a crankbait, but much more lifelike. Originally, minnow plugs were hand-carved from ba1sa wood. Many are still made of balsa, but some are now molded from plastic. Because of their light weight, balsa models wobble more than plastic ones. But they are harder to cast and less durable. Most minnow plugs float at rest, but some sink. The majority of floaters run shallow, from 1 to 5 feet below the surface, a1though some have very long lips and dive as deep as 12 feet. 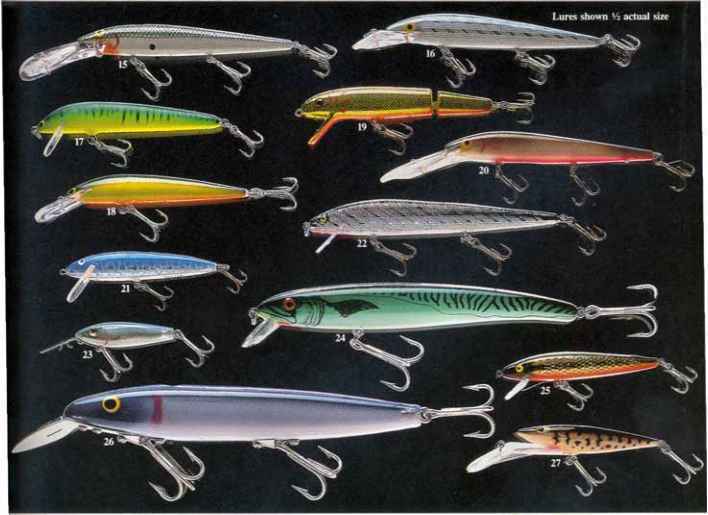 Floating minnow plugs rank among the top lures for casting or trolling a1ong shallow shorelines, over shallow reefs or above the tops of submerged weeds. They can also be twitched erratically across the surface. Floaters work extremely well at night. Fish can easily see the silhouette of the shallow running plug against the surface. Sinking models can be counted down to any depth, but they have less wobbling action than floaters. have an interna 1 wire connecting the attachment eye to the hooks. 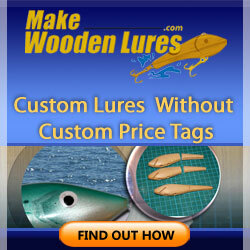 The wire insures that the hooks will not pull out of the soft wood, allowing the fish to escape. The effectiveness of minnow plugs is not surprising because most gamefish prefer thin-bodied baitfish to those with deeper bodies. Baitfish with slim bodies are easier to swallow and less likely to lodge in a predator's throat. Minnow plugs appeal to almost al l gamefish, with the exception of small panfish. They work best for largemouth, smallmouth and spotted bass; walleyes; northern pike, muskies and pickerel; stripers and trout. If you attach a minnow plug improperly, you will dampen its wiggle, making it less effective. A loop knot or small, round-nosed snap works best. Before casting, check the hooks to make sure that they are hanging straight. If they are cocked in the hook hangers, the plug will not ran true. Because of their light weight, floating minnow plngs are difficult to cast. For maximum casting distance, use spinning tackle and the lightest line practical for the conditions. Light line also allows the lure to wiggle more freely. Bait-casting tackle can be used with the larger sinking minnow plugs. To work a floating minnow on the surface, cast it into a likely spot, then retrieve it with sharp twitches. Pause a few seconds after each twitch, as you would when fishing with a popper or chugger. You can fish a sinking minnow plug on bottom by allowing it to sink until the line goes slack before beginning your retrieve. Reel just fast enough so that the lure bnmps bottom occasionally. For suspended fish, count down a sinking minnow plug to the proper depth, just as you would count down a jig (page 95). In most sitaations where a sinking minnow plug works well, a floating minnow plug will work even better. Attach a bottom-walker or pinch-on sinker ahead of the plug to reach the desired depth. The floating plug has a more attractive action and is less likely to snag becanse it rides farther off bottom. Some fishermen doctor their floating minnow plugs to make them neutrally buoyant. A standard floating minnow plug must be retrieved at moderate speed to prevent it from rising quickly to the surface. A neutrally buoyant plug can be retrieved much more slowly, yet it will maintain its depth. Slower retrieves often work better in cool water or when fish are sluggish. CENTER the shot in the hole; otherwise the plug will tip to one side in the water. Seal both ends of the hole with epoxy glue. DRILL a hole large enough for the shot just below the center line and directly in line with the position of the noose. BEND the attachment eye to change the action of a minnow plug. Bend the eye downward for more wiggle; upward for less. COAT damaged areas on the surface of a balsa minnow plug with fingernail polish. Otherwise, the wood will soak up water, ruining the plug's action. How to attached a minnow? How to use a minnow plug? How to work floating minnow? How to fish floating plugs? How to make a lips for trolling minnow? 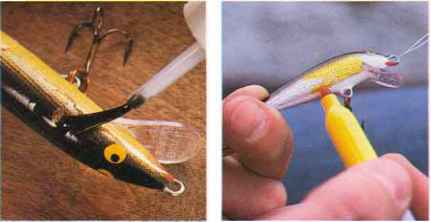 How to attach a plastic lip on minnow bait lure? Is a balsa minnow a plug? 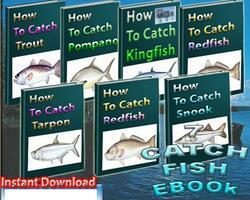 What are the best diving bango lures?